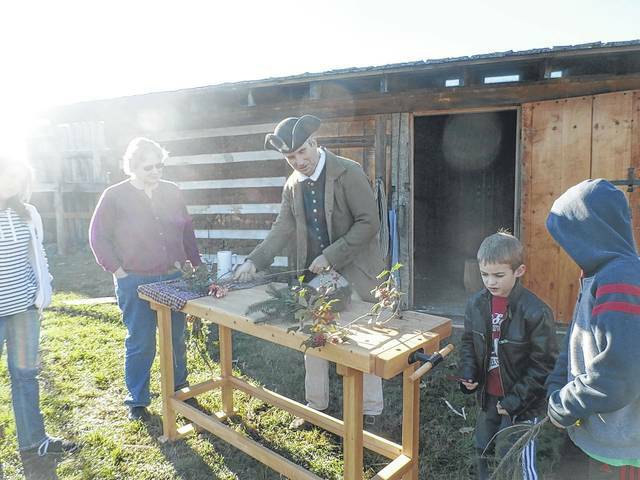 Craig Hesson, reenactor and volunteer at Fort Randolph, shows visitors how to make gifts suitable for those living in the 1700’s at a past Christmas on the Frontier event. This year, festivities are set for this Saturday, Dec. 1. POINT PLEASANT — An opportunity to experience a Colonial and Early American Christmas is happening this Saturday, Dec. 1. Christmas on the Frontier returns to Fort Randolph located at Krodel Park. The fort is open to the public from 10 a.m. to 3 p.m. for the event and admission is free. Visitors can interact with re-enactors while getting warm by the fire at the tavern, or exploring the fort which will be adorned in greenery and other period-correct decorations. Candy and punch are provided to visitors as they experience a Christmas in the 1770’s. This is the last scheduled event of the year at the fort, which reopens for the season each May with the Siege of Fort Randolph, followed by events throughout the year like Ladies Tea, Liberty Days, Tavern Treats and Eats and Tales from the Tavern. Fort Randolph was originally built in 1776 on the original site of Fort Blair. During the colonial era, fort outposts served as protection and defense against Native Americans. Fort Randolph is significant to American and West Virginian history as it served as a safe space for soldiers on the western most border of the frontier. Volunteers now keep the fort operating as an educational and historical destination. Information for this article found at https://fortrandolph.weebly.com. Also, visit the Fort Randolph Re-enactors and Friends Facebook page for more information.